on my most recent adventure. I love my job. I get to meet interesting people, do interesting things and get behind-the-scenes looks into fascinating worlds (if you've never been in a busy kitchen at a great restaurant in the middle of service, you're missing out) and write about it. One of the best things I do is write my monthly Adventure Blog for Bald Head Island Limited. Every month I head over to Bald Head Island and do something. Sometimes I get wet or sandy or muddy, occasionally I'll get mosquito bites or sunburn, but I always come away with a story. In visiting the island so much I've built up a great relationship with the folks at the Bald Head Island Conservancy, a non-profit group dedicated to education, preservation and environmental stewardship of Bald Head Island. 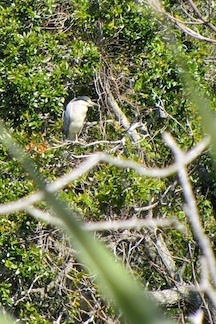 Recently I went with Andy from the Conservancy on a Wildlife Tour of Bald Head Island. As usual, I met some interesting folks, saw some beautiful things and had a great time. And then I got to write about it. You can read my most recent addition to the Adventure Series for The Island Times, Bald Head Island's blog, here. I hope you enjoy.